Production: A Michael Balcon Production for Ealing Studios; filmed as a set of five stories, with a linking narrative directed by Dearden from a story by E. F. Benson: "Christmas Party" (director: Cavalcanti, from a story by Angus Macphail), "Hearse Drivers" (director: Dearden, from a story by E. F. Benson), "The Haunted Mirror" (director: Hamer, from a story by John V. Baines), "Golfing Story" (director: Crichton, from a story by H. G. Wells), "The Ventriloquist Dummy" (director: Cavalcanti, from a story by John V. Baines); black and white; running time: 102 minutes. Released September 1945. Producer: Michael Balcon; associate producers: Sidney Cole, John Croydon; screenplay: John V. Baines, Angus Macphail; additional dialogue: T. E. B. Clarke; photography: Stan Pavey, Douglas Slocombe; editor: Charles Hasse; art director: Michael Relph; music: Georges Auric. Michael Allan ( Jimmy ); Robert Wyndham ( Dr. Albury ). "Hearse Driver": Antony Baird ( Hugh ); Judy Kelly ( Joyce ); Miles Malleson ( Hearse Driver/Bus Conductor ). "The Haunted Mirror": Googie Withers ( Joan ); Ralph Michael ( Peter ); Esme Percy ( Antique Dealer ). "Golfing Story": Basil Radford ( George ); Naunton Wayne ( Larry ); Peggy Bryan ( Mary ). "The Ventriloquist's Dummy": Michael Redgrave ( Maxwell Frere ); Hartley Power ( Sylvester Kee ); Elisabeth Welch ( Beulah ); Magda Kun ( Mitzi ); Garry Marsh ( Harry Parker ). Klaue, Wolfgang, and others, Cavalcanti , Berlin, 1952. Pirie, David, A Heritage of Horror: The English Gothic Cinema 1946–1972 , London, 1973. Everson, William K., Classics of the Horror Film , New York, 1974. Barr, Charles, Ealing Studios , London, 1977. Perry, George, Forever Ealing , London, 1981. Eberwein, Robert T., Film and the Dream Screen: A Sleep and a Forgetting , Princeton, 1984. Brown, Geoff, Michael Balcon: Pursuit of Britain , New York, 1990. Barr, Charles, Ealing Studios , Berkeley, 1999. Documentary Newsletter (London), no. 7, 1945. Kine Weekly (London), 6 September 1945. Variety (New York), 19 September 1945. Monthly Film Bulletin (London), 30 September 1945. Hollywood Reporter , 28 June 1946. New York Times , 29 June 1946. Variety (New York), 3 July 1946. Motion Picture Herald (New York), 6 July 1946. Villegas Lopez, Manuel, "Analisis de los valores, Al morir la noche ," in Cinema: Técnica y estatica del arte nuevo , Madrid, 1954. Barr, Charles, "Projecting Britain and the British Character" (2 parts), in Screen (London), Spring and Summer 1974. Brossard, Chandler, in Film Comment (New York), May-June 1974. Ecran Fantastique (Paris), no. 2, 1977. Ecran Fantastique (Paris), September 1986. Branagh, K., in Premiere (Boulder), February 1993. Aachen, G., " Dead of Night ," in Reid's Film Index (Wyong), no. 30, 1997. Dead of Night' s status as the first British horror film of note (advanced most convincingly by David Pirie in his book A Heritage of Horror ) rests largely on the Robert Hamer-directed "Haunted Mirror" episode. Certainly this masterful piece of work, with its depiction of a destructive sexuality emerging from the 19th-century setting reflected in the mirror, anticipates elements of Hammer horror in the 1950s and 1960s. However, the film as a whole can also be seen as a response to the social dislocations caused by the end of the war, and in particular a confusion in masculine identity arising from difficulties in integrating a large part of the male population back into civilian life. On one level, Dead of Night reveals a male fear of domesticity, which is here equated with emasculation and the presence of strong, independent women who are seen to have usurped male authority (one thinks of Googie Withers organising her wedding while her fiancée waits passively in his flat, and of Sally Ann Howes violently rejecting the amorous advances of a fellow teenager). 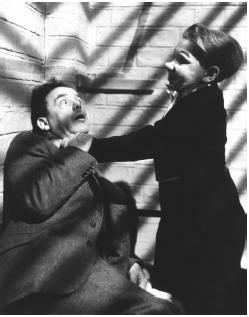 The film is full of weak, crippled, and/or victimised male characters: an injured racing driver, a boy murdered by his elder sister, a meek accountant dominated first by his fiancée and then by the influence of the "haunted mirror," and—in an extraordinary performance by Michael Redgrave—a neurotic ventriloquist who eventually collapses into complete insanity. It is significant in this light that the character whose dream the film turns out to be is an architect, a symbolically charged profession at a time of national reconstruction. That this architect is indecisive, frightened, and, at the end of his dream, shown as harbouring murderous desires underlines the film's lack of confidence in the future. This can be connected with what is in effect a systematic undermining of one of the characteristic themes of British World War II cinema, namely the formation of a cohesive group out of diverse social elements. (Ealing Studios, which produced Dead of Night , contributed to this with, among others, San Demetrio London and The Bells Go Down. ) Dead of Night begins with a group of characters coming together, but here this is not in the interests of establishing a national consensus. Instead this group is fragmented by the film's insistent stress on the ways in which each individual is trapped within his or her own perceptions and mental processes. Each story tells of a private experience, something that more often than not is witnessed by only one person. The sense of alienation thereby produced further manifests itself in the many references in the film to acts of vision which are unreliable or compromised in some way. Repeatedly characters stare disbelievingly at the "impossible" events unfolding before them. Seeing is no longer believing. The faith in an objective reality central to British wartime documentaries and which also contributed to the style adopted by many fiction films has been eroded. Dreams and fantasies have taken its place, to the extent that, as one character puts it, "None of us exist at all. We're nothing but characters in Mr. Craig's dream." The complexities of Dead of Night are beautifully crystallised in the moment where the psychoanalyst who throughout the film has argued for logic and reason accidentally breaks his spectacles. The clarity of vision induced by a wartime situation has been similarly shattered. All that remains is an uncertainty and fear which the film records in an obsessive and disturbing detail.